This book was given to me, as a member of #RBRT, by the author in return for a fair review. Okay, here goes. Seren enjoyed this book very much. She likes the pictures (illustrations) and she loves the story. She likes the idea that she can be anything she wants to be when she is bigger. (which is what her mummy says to her) . And she runs to the door when Daddy (or Mummy, she adds) comes home from work. And, occasionally the rhyming isn’t quite there. Turning the pages to see what happens next seems to be important for children in picture story books. So , often there are connecting words ” And/But /So.”Or often those three little dots – the ellipses. Not being any in A Most Reluctant Princess,I felt the story to be a little disjointed. But these last few paragraphs are obviously an adult point of view. And, to be fair, I should say I teach creative writing and picture story books are an included genre. This entry was posted in #RBRT, blogging, Book Reviews, Books, Childrens' Fiction, Picture Story Books and tagged #blog, #RBRT, #tuesdaybookblog, #womenauthors, #womenwriters, #womenwriting, authors, books, Children's picture story books by Judith Barrow. Bookmark the permalink. Thank you Judith and Seren, a lovely review. Oh, now I’m getting excited about doing a UK sequel. I’ll be on your side of the pond next month. I can’t wait! My first visit to London! I’m only going to be in London for a couple of days. The rest of our holiday will be in Paris visiting my beautiful granddaughters. 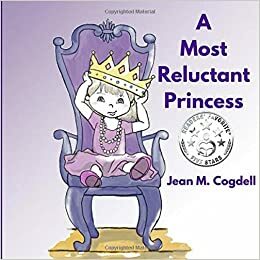 Judith Barrow with her review (aided and abetted by her granddaughter) for A Most Reluctant Princess by Jean M. Cogdell.